The American Dream is Alive. The American Dream is still live in all of us. That dream is alive, but not well. Many have fallen into the traps created to break the spirit and crush dreams. Traps mostly created by ourselves such as, self-doubt and a defeatist mindset. Traps also created by outside forces like mainstream media constantly bombarding us with negativities from the economy to none since like income gap. We live in a time where people can connect to each other from across the globe and share ideas and dreams. When the world is ready there will be little need for government or any systems that crush people’s dreams for what they want to be or how they enter act with others. The more governments control and spy on its citizens is proof that their controls are slipping. US Government is deep in debt and shows no signs of slowing down its spending. There will come a time where governments just like its citizens realize that wealth is not created by spending but by saving. Let the law of compounding interest work for you. Debt is an addiction plain and simple. We must heal ourselves from this addiction. I have been working on my family’s debt for nearly five years now, and the freedom of being able to say “I’M DEBT FREE” will be a great day. Here are some words of advice on achieving your dreams. Dream BIG! Believe anything is possible. Write down your dreams, and think of way to achieve them. Success is not an overnight thing. Success is a marathon not a sprint. Never give up. Most dreams fail before they even are tried. Life is a roller coaster. Enjoy the ups, but prepare for the downs. The economy goes through a recession about every ten years, but will rebound. Establishing a Food Forrest With Jack Spirko. Jack from The Survival Podcast takes you through the process of developing a food forrest. Time has come for a change. Change in how we think and act. The time for squandering of our resources is over. Ever heard the term Peak Oil, peak oil is when oil has nearly ran out and prices are too high for the average person to afford. Oil prices have more ups and down than a roller coaster these days. Even of peak oil is not reached in our life time is it ethical for us to misuse it at the expense of future generations. We live in a consumer base culture today where we have the luxury of buying a new IPad or other devices every year. Once the new model is released the new one is discarded. Ask yourself is this ethical? When your dishwasher breaks do you replace it? Can it be repaired? Items cost nearly as much to repair as it does to purchase a new one and you are stuck with the older technology. We can change from consumers to producers. Produce your own goods and reuse the old and not so worn out items. Things can be repurposed. My deck on my house needed replacing, and I used the frame to build my chicken tractors. No material from that old deck went to waste. I’m not saying leave all society behind and join a hippy commune, but just be aware of how much wastefulness you have. 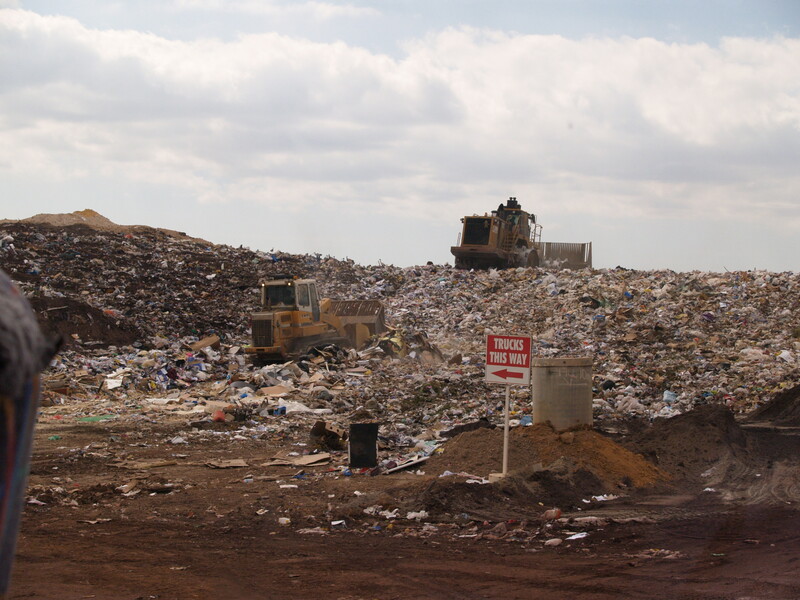 Keep in mind just because you threw something away doesn’t mean it no longer exists. Be aware that when you treat your lawn with pesticides and fertilizers, and it rains all those chemicals wash away and possibly down the storm drain where the chemicals have the potential to damage eco-systems. Back to basics Permaculture 2: Principle 1 Observe and Interact. 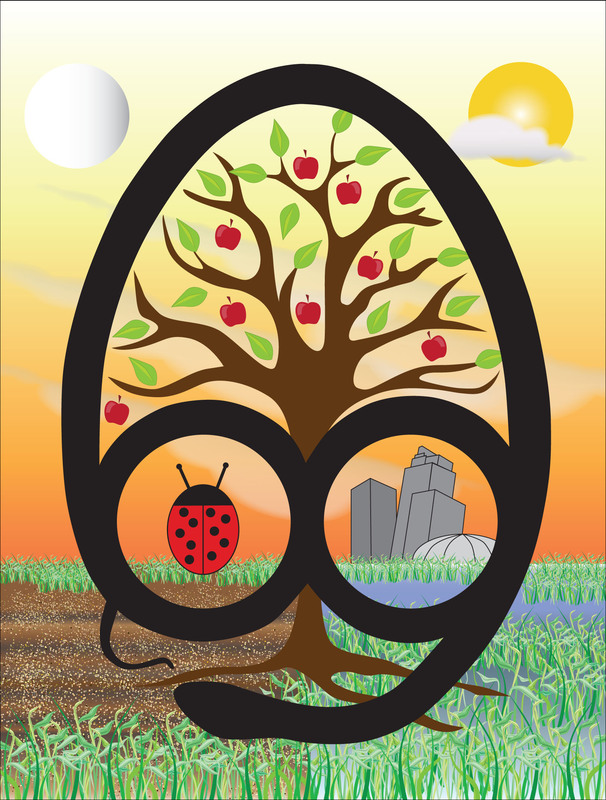 Permaculture design is more than just how to grow food. It’s a system of design that can be applied to any issues you may have in your life. Take the example of finical freedom; many families today are deep in debit. By using the permaculture principle of observe and interact I can pay off debit and increase financial freedom. Living beyond you means is the leading cause of money troubles today. We are bombarded with ad after ad telling us we deserve this car, we deserve this new computer, and so on. The number one service marketed today is debit. Now how do we remedy this? Observe and interact! Observe your spending habits and come up with a written budget for each month. As the month goes by interact (make changes to that budget as issues arise) but stick to the game plan. The road to financial freedom is a long and hard road. It can be done my family of on the last leg of this journey. It has been a very difficult five years, but it’s almost over. Let’s get back to basics. The basics of Permaculture and to Permaculture relates to freedom. To begin the Prime Directive of Permaculture, “The only ethical decision is to take responsibility for ourselves and for that of our children.” Now how does this relate to our personal freedoms? Taking responsibility for one’s self is the essences of freedom. For example, getting a loan to buy a car the bank loans you the money, and in return must pay the amount borrowed back plus interest. On top of that they require you to purchase insurance that has more coverage than the basic policies. You are not given the choice to choose of just a liability policy. Your freedom to choose was taken away by not purchasing the car with your money. Taking personal responsibility and saving money to purchase the car would increase your freedom. The three Ethics of Permaculture are, “Earth Care, People Care, and Return of Surplus.” Earth Care: All wealth comes from the earth, and caring for the earth insures wealth for you and for future generations. People Care, any actions taken without the care of people in mind is not ethical in Permaculture. Also called social capital when applied to business the company will not stay in business if care for its customers is not a priority. Return of Surplus, in Permaculture our goal is to create a surplus. Surplus can be spent in three ways, spend, save, and give away a little. You work hard obtain a surplus, so enjoy a little. 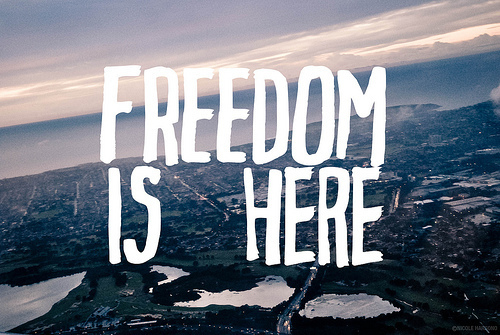 For that rainy day save a little, this is where freedom comes into play. Many today rely on government when disaster strikes. Being prepared for unemployment, health issues, or natural disasters is the insurance for the real world. You must store food, energy, and money for emergencies. Give some surplus away to charities and such, but also return surplus to your systems. The surplus of chicken manure is returned to the land to fertilize it. If you have any questions of tips leave a comment of email me freedomfarmtv@gmail.com. The joys and discoveries of Permaculture always amaze me. For more than a year now I have been implementing the design that I have laid out for my three acre homestead. In that time soil improvement has been my main focus. This year I have experimented and mother nature drop surprises at me. 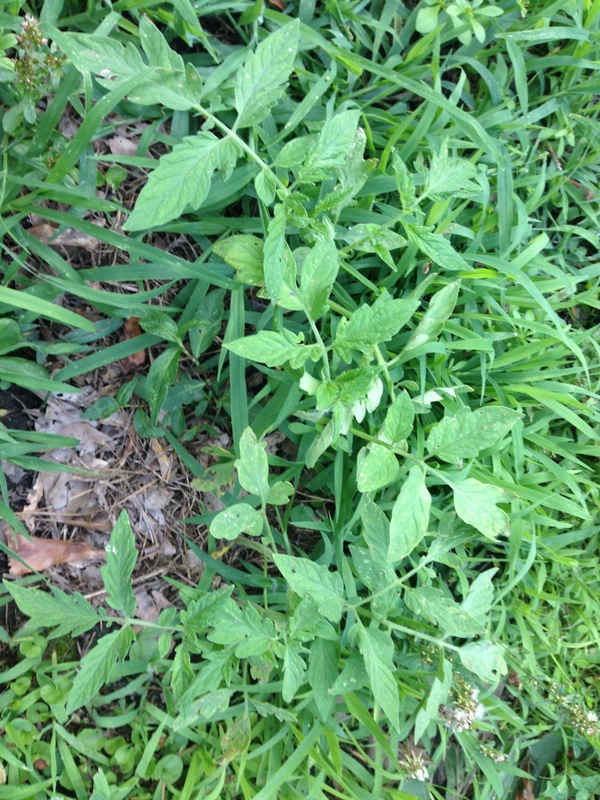 This is a picture of tomato plants that sprang up near one of my garden beds. Last year er planted several tomato plants, and the chickens loved foraging the fruit from them. My wife and I didn’t stop them because er figured they would just be “egg plants” instead. Apparently the chickens dropped tomato seed as they feasted, and these plants are the product. A very nice discovery. This year I have played around with planting everything I could get my hands on. 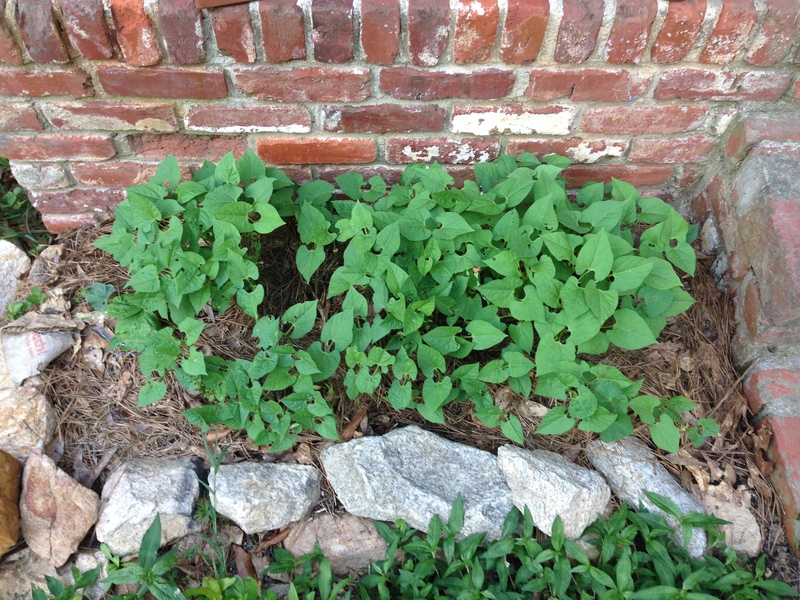 I planted store bought potatoes and garlic that sprouted before they could be eaten. I bought and planted bags of dried beans from the store. The germination rate blew me away. I guessed some would sprout, but not like this. One pound bag cost me $1.19 where as a packet of beans from the farmers supplies were $5 on sale. I hope they produce a harvest but I was really wanting nitrogen fixers in my garden beds. 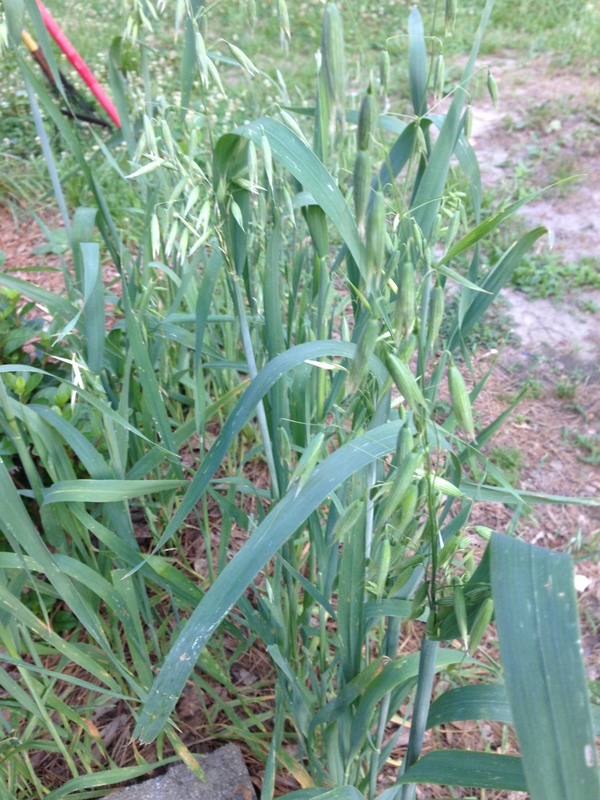 I also planted oats that I purchased from farmer supply. I buy oats in the fifty pound bags to soak and feed to my chickens. Hugelkultur or wood core bed is a Permaculture for growing plants, bushes, and trees. I installed my first bed this year. I plan to plant pear and peach trees along with some support species in the fall. For a woody bed dig a trench, I like mine on contour to slow rain that runs down slope. After the trench is dug fill the trench with wood preferably hard wood because it takes longer to decompose. Then back fill the trench with the soil you removed. Cover crop it and sheet mulch it. 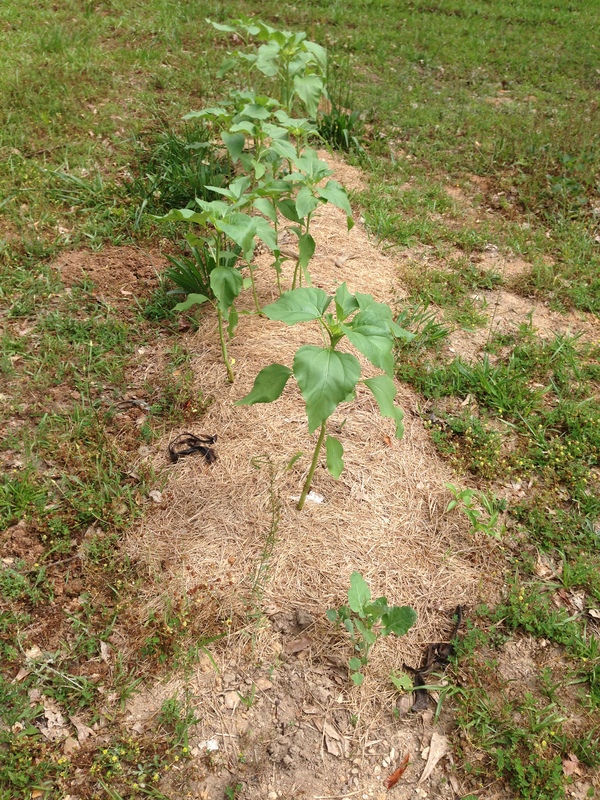 I used sunflowers, broccoli, and pole beans as my cover crop, and covered them with straw. Later I will plant comfrey for dynamic accumulator, peach and pear trees, and almond trees for a nitrogen fixer. This is my fist one, but I plan on many more again all on contour about four feet apart. This will be my food forest. Geoff walks through a small urban lot packed full of Permaculture design. A poly-culture of cabbage, broccoli, and romaine lettuce.